Sterling Silver Hawaiian Plumeria (frangipani) Link Bracelet. Features open frame linked flowers, with highly polished anti-tarnish finish, each flower is 8mm in diameter. Secures by a T bar thread through a loop. Measurements: Flower diameter 8mm. 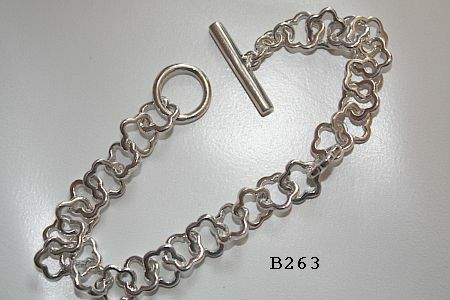 7.5 inches, 190mm bracelet length.